Those of us who were born in 1948 will be turning 70 this year and those born in 1949 will be turning 69. Thanks for helping to organize such a great event. You’re right Ted! Our math isn’t so great. We want to celebrate with those that were born in 1949! Just a short note to say a BIG Thank you to each and everyone of you!! 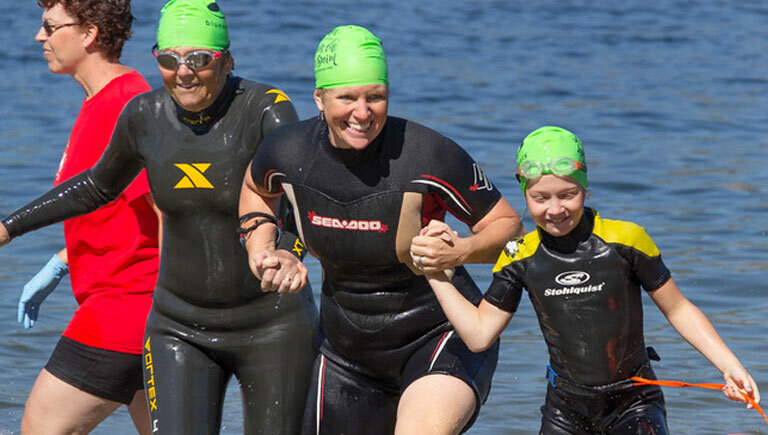 Thank you for all that you have done for the event this year and for giving up all of your spare time to make this event happen… This was my first time being a part of your event to swim across the lake and it was fantastic..
On the day of the swim, everything was so well organized, it was incredible. Love the towel & water bottle and after the swim to be handed the swim cap was the icing on the cake!! Great designs, colors you have chosen and nice quality in the swim cap too! I just wanted to thank the race organizers and volunteers for a job well done. I thought the Across The Lake Swim was a FABULOUS event and very well run. I appreciated being able to participate in the pre-race swim clinics to ease my apprehension about swimming in open water (this was my first open water swim event). I thought the ATLS was great value for the registration fee. You had the best race package I have EVER seen, with tons of goodies and I loved the swim towel and cap.